Jesus wanted to get away from the crowds so that He could be alone with His disciples to teach them. He wanted their undivided and undistracted attention so that they would understand what they must understand. They must understand what is going to happen before it happens so that when it happens they will understand. It would have been nice if they would have ‘understood’ that God was about to redeem the whole world through the suffering, death and resurrection of His only-begotten Son- their teacher. But as is the case with us too, ‘understanding’ the ‘mysteries of the Kingdom of God’ is rarely gained in a classroom or on a retreat. ‘Understanding’ comes by the experience of trial and error; by falling and being lifted up again; by failing and forgiveness; by dieing and rising to life again. And so off to Capernaum they go. Back into the real world. And along the way the disciples, thinking they are out of ear-shoot of Jesus, argued amongst themselves about who is the greatest. And we wonder – the greatest what? The greatest fisherman, the greatest tax collector, the greatest student? No, the greatest disciple of Jesus. It’s probably too much to think that any of them would have actually been so crude as to blurt out, “I’m the greatest” and then state the reasons why they thought so. Only a very few are that obnoxious, and they tend to be limited to boxers, wide receivers and political candidates. BUT NOT DISCIPLES OF JESUS. But we all know how these arguments go. It’s much more subtle than that. Parents talk with other parents about the accomplishments of their children. There is a steady volley of one-upsmanship until there’s only one left standing and they’re the greatest parent. Students compare the colleges they attend or have been accepted at or hold degrees from. Those who can’t compete with prestige argue for greatness based on having the best football team or being the best party school. Pastors do the same thing and it’s all very subtle. Usually it’s a complaint that this is such a tough job because my congregation has gotten so big. Everyone gets the point. Sometimes the criteria is the size of the most recent building addition. Those of us who can’t compete usually call a foul for unnecessary roughness and ask who still studies the scriptures in the Greek and Hebrew for sermon prep. Capernaum was Jesus headquarters when He was in the region of Galilee. Mark says, “they went to the house.” “The house” was most likely Peter and Andrew’s house. Once inside “the house” Jesus asked, “What were you discussing on the way?” And St. Mark writes, “But they kept silent…” It was one of those “Garden of Eden” questions that makes you want to find the nearest tree to hide behind or a rock to crawl under. “The Lord God called to the man, ‘where are you?” “Who told you that you were naked?” (Gen.3). But they’re not ready for confession just yet. They know that anything they say can and will be used against them in the divine court of law, and so they take the 5th. Their silence was the silence of guilt. So, what if Jesus were to ask you the same question? What were you talking about on the way into church today? Or would ‘argument’ be a better word? What were talking about at home, in the car, at the office, at school, on Facebook? And what about that conversation that you’ve been having with yourself for some time now? That conversation about how much better you are than your co-workers, or classmates, or friends or other members of the congregation. In response to their silence, Jesus “sat down and called the 12 to him.” “If anyone wants to be first he must be the very last and the servant of all.” It was another one of those, “they didn’t understand” moments for them – and it’s the same for us. Jesus Christ is the greatest among us. Any anyone who ‘UNDERSTANDS’ that, is absolutely always going to excuse himself from every contest for ‘greatness’ among others. Along with all of the disciples, there must also have been a child in the house. “And He took a child and put him in the midst of them.” The Greek language has several different words for child just like we do. The word here is “paidos,” what we would call a toddler, just past infancy, not able to stand up on his own. 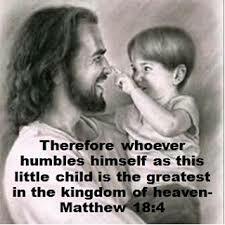 No, this little child is “the greatest in the kingdom of heaven” because Jesus Christ had this little child in His arms. If you want to be great, REALLY GREAT, you have to let Jesus Christ put His arms around you. Little children have no problem with that. They love it. They line up for it. But as the children get older and more mature, they get the idea that they’re too big for this stuff. They’re too GREAT for this baby stuff. And by the time the child becomes an adult, we’re downright embarrassed to be embraced like a little child. The one who is in Jesus’ arms is the greatest in the Kingdom of God. Greatness is having Jesus take us in His arms. And that’s what makes you, dear children, GREAT. You are the greatest in the Kingdom of heaven, not because of your accomplishments or prestige or potential. You are ‘the greatest’ because Jesus Christ, the Son of God, has humbled Himself and become YOUR SERVANT. He is the Divine Servant – a combination of two words which this world does not understand. But you do. You understand that, in your baptism, Jesus Christ took you in His arms, and you became the greatest. For who could be GREATER than the one whom Jesus Christ holds in His arms? You understand that the ‘greatest among you’ is the Divine Son of God, who does not consider ‘greatness’ before God – let alone before man, a thing to be grasped. •	The ‘greatest’ humbled Himself and made Himself nothing to serve you by holding you in His arms as He is crucified on the cross, and you are crucified with Him. •	He holds you in His arms as He rises from the tomb and you rise with Him. •	He holds you in His arms as He ascends into heaven and you ascend into heaven with Him. Who could ever be ‘greater’ than the one whom Jesus “takes in His arms”? It doesn’t get any greater than that – and neither do you. •	And the truth is, you’re never too big to be that small. •	You’re never too strong to be that weak. •	You’re never too great to be held like the ‘little child’ that you are in the arms of Jesus. But just like the disciples, this is a hard lesson for us to learn too. And we’ll spend the rest of our lives trying to learn it through failure and forgiveness, falling down and being lifted up again. Dieing and rising to a new life in Christ, over and over again. But just imagine if we could learn what ‘true greatness’ really is. What freedom. •	perfectly content to be like a little child in the arms of Jesus.